It’s a busy start to fall at Indy Podiatry, where the office has participated in numerous running events around Indianapolis. 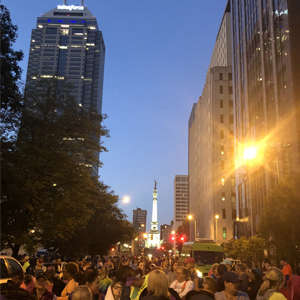 Indy Podiatry participated in the Indy Women’s Half Marathon and 5k Fitness Expo on September 28th, where runners and walkers could pick up free massage balls and enter for a chance to win a pair of shoes from Athletic Annex. Doctors Higgins and Chhiba were also available to chat about any foot or ankle problems bothering participants. 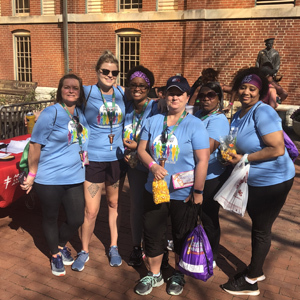 Haley Meadows, Director of Patient and Community Relations and Marketing, also ran the 5k on September 29th, where she joined over 300 women to race the streets of downtown. The starting line of the Indy Women’s Half Marathon and 5k at 7 AM. The office participated in the Uncorked Wine 5k Run/Walk on October 6th, where Indy Podiatry staff tasted different wines along the course to the finish line. A portion of proceeds benefited local charities. It was a beautiful day for walking, laughing and drinking wine downtown! 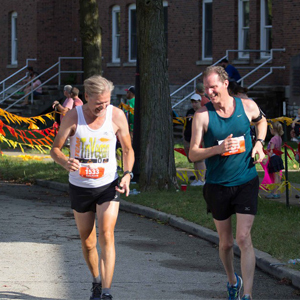 Lastly, Dr. Helms and his friend from New Mexico ran in the Indy Half Marathon at Fort Ben on October 6th. The race took place in historic Fort Harrison State Park, a gorgeous fall tour through the park and surrounding neighborhoods. Lump or bump on your foot? Join our monthly newsletter for the latest updates on foot and ankle care.